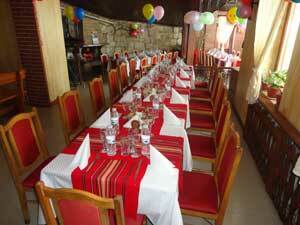 The restaurant has a capacity of 70 seats and summer garden with 100 seats. Here you can enjoy the best of Bulgarian cuisine, Tutrakan's fish meals and amazing duck specialties. Cool in summer and cozy by the fireplace in the winter, at "Inn Dalboka" you will feel comfortable and peaceful, enjoying the unforgettable moments with friends, colleagues and relatives. Pleasant atmosphere, delicious food, professional service and live music are in themselves a prerequisite for one wonderful experience. View photos from the restaurant.